Jonathan Pfeffer: A man who needs no introduction. Jonathan: My name is Jon and I am Capillary Action. I would also like to state that Matt Andrews and I have a half Puerto Rican/half Sasquatch lovechild named Hector. Scene Point Blank: Intriguing. How did you get started playing music? Jonathan: My mom made me pick up an instrument in 3rd grade, so I chose the cello because...I'm not sure why exactly. I played the cello for a few months and quickly became bored with it. She wouldn't let me off the hook, so I picked up the saxophone and the cycle continued. She told me I had to pick another instrument and, long story short, I've been playing guitar for the last 6 or 7 years. Wow has it really been that long? Scene Point Blank: Yes Jon, yes it has. So when did you actually start writing the music that became Capillary Action? 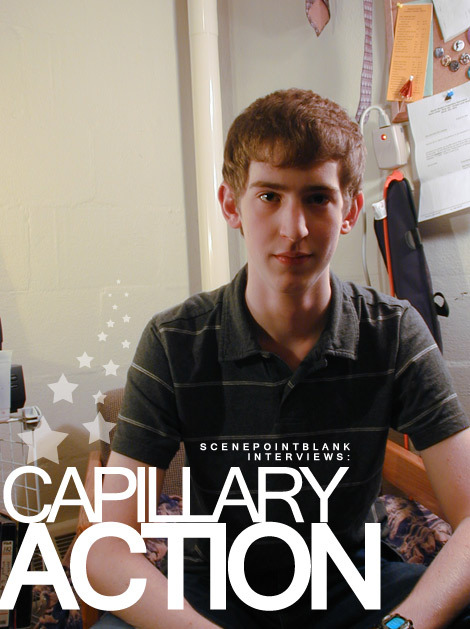 Scene Point Blank: How would you describe Capillary Action's sound? Jonathan: Our old drummer Jeff described the music as "abstract instrumental pop" and I kind of find it fitting, though I can't explain why. I guess I like it because it's pretty open to interpretation. I've heard the term "prog" thrown a lot when describing my music but I feel my stuff isn't as academic as the term "prog" might imply. How would you describe the music, Matt? Scene Point Blank: Hm.. I'll get back to you on that. Where did the name come from? Jonathan: The project was originally called Noiseland Arcade but that name was apparently taken by a fictitious side project featuring Buzz Osbourne from the Melvins. So, late one night, I decided that I needed a new name so I randomly did a search for 'fluid dynamics' and came across 'capillary action.' I thought the name had a nice ring to it and no discernible flavor that would give away my artistic intentions (as opposed to "angry beavers throwing onions" or "goreblood combustication") so I ran with it. Do you like it? (aside) Oh man, I had tofu burrito casserole for lunch. My stomach is exploding. Scene Point Blank: It's definitely better than a Simpsons reference. What about the record name 'Fragments'? Was that intended as a description of what the music is? Jonathan: Yeah, for the most part. One of the underlying intentions behind this record was to see if I could get away with mashing together a bunch of distinct parts without any sort of explanation. At the time I thought I was being pretty clever but looking back on it now, it wasn't a particularly original concept and one that certainly had a lot of flaws. I feel like the abrupt, ADD sort of songwriting style is definitely my niche to a certain degree, but I'm trying to either refine that formula or break away completely from that in the songs I'm writing now. Scene Point Blank: So did you envision touring with a band at first, or was it always going to be just you? Jonathan: I didn't really envision anything at first, to be quite honest. 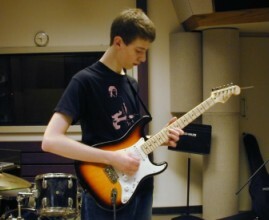 This all started when I figured out that I could make mp3s of my own music (I'd been recording on a four-track and a boombox up to that point) by plugging my guitar into the mic-line output on the back of my computer and playing through Windows Sound Recorder. I had a huge stockpile of riffs and little musical ideas floating around that I hadn't recorded, so I'd just sort of jam on some riff and then take it from there. "Fragments" is simply the product of me improvising at ungodly hours of the morning using Windows Sound Recorder. I didn't start seriously thinking about playing live until I started recording the album in late 2003. Posted Feb. 28, 2008, 4:41 a.m. Breaking News Joe Lally & Capillary Action Robbed In S.F. Posted Nov. 16, 2007, 1:54 p.m.
Posted Jan. 2, 2007, 1:06 a.m.